Blakers Park is a well-loved and well-used community space in the Fiveways area of Brighton. Although compact in size it has a large number of features including a small friendly café, tennis courts and a recently renovated playground. 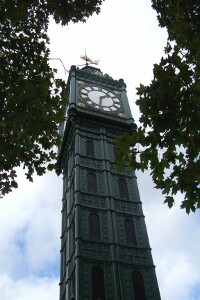 The park also contains a distinctive Victorian clocktower. For more on the history of Blakers Park and other information, go to the Friends of Blakers Park page. The 56 bus runs close to the park during the day. Further information and timetables available from the Brighton & Hove Bus company. There is limited free parking available on Cleveland Road and Southdown Road. In the middle of the park is its most recognisable feature, the fifty foot high Clock Tower. Unveiled on the 15th September 1896 and donated by the park’s founder Mayor Alderman J.G. Blaker, it is made of steel, cast iron and finished in bronze. Today it remains as a main focal point of the park, offering a unique area to enjoy some food and drink from the nearby cafe.